There is a wide range of products made by women entrepreneurs in this segment, from the conventional everyday use items to elaborate trousseau-mixes to the traditional handicrafts. We will be adding more such crafts that are both colorful and decorative to bring brightness to a room. Many of these are ethnic crafts are hand-made since centuries and the skills are taught from generation to generation. 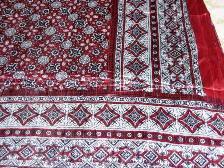 Other than the handicrafts type home textile, there are trendy conventional bed sheets and covers as well as table cloths and napkins made by women at their homes. A number of large exporters outsource their excess requirements to several small set ups and that also include industrial homes and centres for women. This provides livelihood to a large number of women. In home textile the variety and styles are totally unique...again the fusion style comes to the play in a big way. 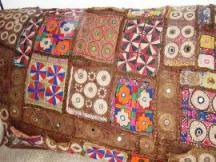 Lovely ralli art work ... very much like the patchwork quilts .... are a delight for the eyes. Beautiful patterns developed out of small color co-ordinated or even random pieces come to life in an exquisite piece of hand-made wonder. A hallmark of the Indus Valley civilization, the province of Sindh....this ancient artwork is made from vegetable dyes with block prints in navy blue on maroon background traditionally. The vibrant patterns when added with some hand embroidered thread work, turn into pieces of art. These can be used as throws, bed sheets and table covers. 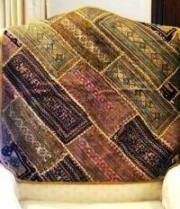 Then there is the exquisite Thar art, hand-embroidered patch work for throws, sofa back covers, table covers etc. You can place these pieces of art on any surface to give a rustic ornate look without a lot of effort. These pieces carry an inbuilt antique look which is reminiscent of the old royal eras. Beads, sequins, gold thread and colors, on rich color backgrounds are each a work of art in themselves. Swati embroidery has geometrical patterns covering the entire length of the piece. Intricately designed, these pieces are unique in style. 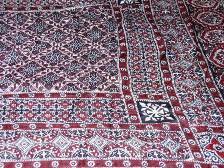 Similarly, the floor rugs are woven in patterns that run the entire length of the rug. These are mostly used as runners for table tops or made into cover for floor cushions. Hand embroidered with colorful thread work and mirrors, add warmth and glow to any interior. 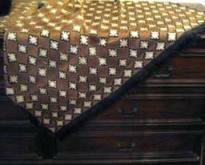 Developing designs and patterns as well as the co-ordinated bed sets - with bed sheets, pillow and quilt covers, women are usually adept at bringing comfort with style to any room. Here we see bed rooms and kids' rooms - all done up to look welcoming and relaxing.